Compact yet very effective, HORIZON MINI FLEX is a curvable linear LED system made of highgrade extruded aluminum. It is available with optics and lenses that provide incomparable control of light intensity and quantity. HORIZON MINI FLEX is totally customizable and a perfect response to the specific needs of commercial, institutional, and pirvate spaces. 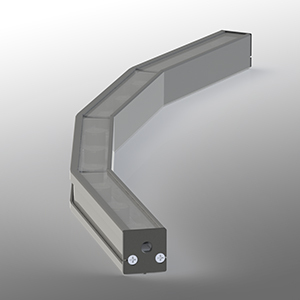 The increments allow you to curve on-site the HORIZON MINI FLEX, for no visible light interruption. It can be used to reinterpret its environment with surface grazing with a long throw or edge lighting. Available in 3W/ft, 5W/ft and 7.5W/ft. 24V: increments of 2” (51 mm), 4” (102 mm) and 8” (203 mm). X= Increments of 2”, 4” or 8” (51, 101 or 203 mm).